Long time readers of Scotch Addict will probably recognize that I don’t drink many blended Scotch whiskies, as many of my tasting notes are of single malts, but I do enjoy a blend from time to time to add a bit of variety. One of the blends I’m familiar with is The Famous Grouse, close cousins to The Macallan and Highland Park (each is owned by the Edrington Group). One of the things I was sent was a recipe for the Black and Blue, a drink inspired by barbecue and includes The Black Grouse. 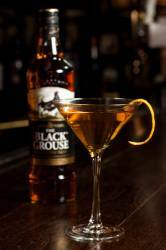 The Black Grouse is intended to be a more heavily peated special edition of The Famous Grouse. You’ll note how it’s called the “darker” grouse because of the smokier character and features a black grouse, rather than a red grouse. The tasting notes read more like an Islay, with a peaty-smoke nose followed by sweetness. The taste features a smoky-sweet tones, hinted by the nose, followed by cocoa and spice. The finish is said to be long, peaty, and aromatic with gentle smokiness. Having never tried the Famous Grouse (yet), I have no basis for comparison but I suspect this popular blends satisfies even the most aggressive of peat lovers. As an added bonus, The Famous Grouse donates 50p for every bottle sold to the RSPB to help safeguard the 85,000 acres that make up the native habitat of the black grouse. All in all a simple recipe created by Beverage Manager Tinika Green and Andrew Duncan, bartender of famed BBQ restaurant Blue Smoke, NY. What is a Vatted Malt? Now that you’re familiar with the differences between blended and single malt scotches, let me introduce a “third” type – vatted malt (or pure malt). Despite my calling it a third type (see the quotes? ), vatted malt is really a blended whiskey without the grain whiskey component. Vatted malts, like blends, mix a variety of single malts together in an attempt to get a totally new flavor. With blends, grain whiskey can be used to thin out the flavors a little in order to achieve some balance, though many enthusiasts consider it to be cheapening the flavors. Since no one publishes a list of what’s in a blend, it’s really tempting to put in cheap grain whiskey because… it’s cheap. As for vatted malt, it’s somewhat confusing too. Malt refers to the the mixture that will be fermented and vatted just means put into a big pot or container. Vatted malt would lead you to believe that malt from a variety of sources is put into a container and fermented together, but that’s not the case. While much of the flavor is determined by the malt itself, there are flavors, mouthfeel, and other characteristics that develop in the cask while it matures in the warehouse. If you mix the malts and mature in the same warehouse, you lose a lot of that. In reality, the vat refers to the blending process after the individual whiskeys have matured and would otherwise be consumed. 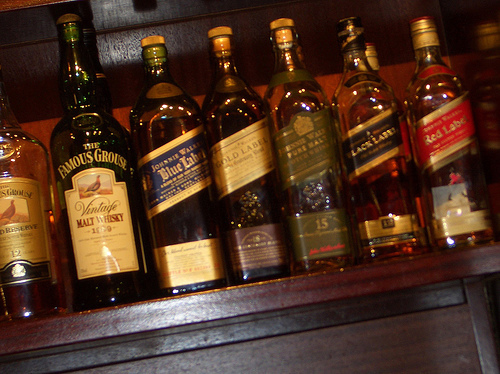 Johnnie Walker Green Label, Eleuthera by Compass Box (vatted from Caol Ila and Clynelish), and Famous Grouse 10 yr. are among the few well-known vatted malts.